The report in the previous blog entry that the season was at an end was certainly proved wrong with a cracking Red-flanked Bluetail found at the Obs in the morning; it showed brilliantly well and eventually hopped into one of the Heligoland traps to become our 100th species to be ringed this year. The second record for the island and the fifth for Orkney - all of which have been in the last five years. Other migrant totals for the last day of the month included 8 Woodcock, 6 Blackcaps, 2 Goldcrests, 2 Chaffinches, 12 Robins, 71 Blackbirds, 46 Fieldfare, 2 Song Thrush, 116 Redwings, 68 Snow Buntings and single Pied Wagtail, Black Redstart, Wheatear, Chiffchaff and Brambling. There was a slight build up of wildfowl as well including 26 Shoveler, 11 Long-tailed Ducks and 9 Red-breasted Mergansers while a Hen Harrier and two Merlins were seen. 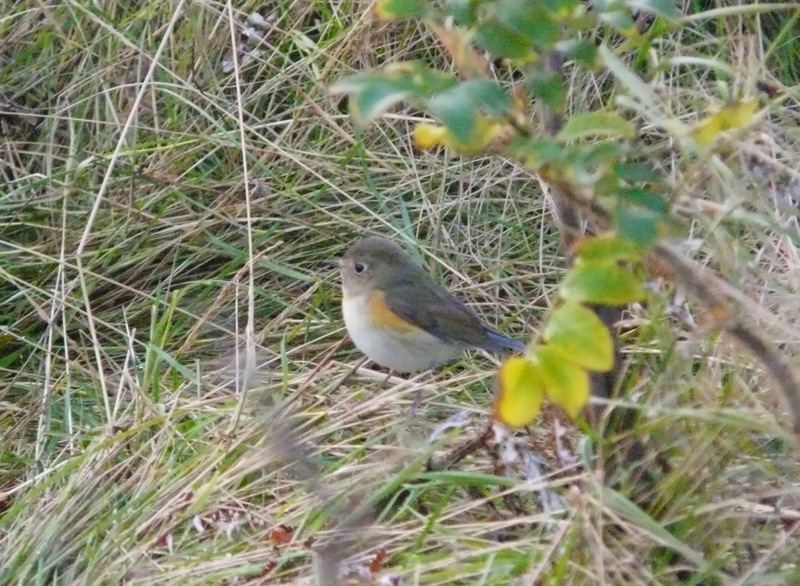 Today's Red-flanked Bluetail was the 3rd BBRC rarity to have been found/trapped at the Observatory this autumn. As well as boosting the years ringing total by well over a 1000 birds-it's days like today which really reward the staff for their effort and hard work in building the traps over the last couple of years and in developing the habitat with, crops and planting trees at the site. Another pleasant couple of days although there is a real 'end of season' feel to the birding at the moment; the 29th was fairly quiet with a 2nd winter Glaucous Gull the pick with a Wheatear, the two Goldfinches and the Yellowhammer still lingering. A nice morning on the 30th produced a couple of late scarcities with a Common Rosefinch a bit of a surprise at Holland and a Little Bunting in Kirbest crop a bit more expected; other passerines included a single Lesser Redpoll with 5 Mealy Redpolls, two Black Redstarts still and dwindling numbers of Thrushes, Robins, Blackcaps, Goldcrests, Chiffchaffs and Finches while two Hen Harriers and two Merlins cruised around. There were also some impressive spectacles to be seen with at least 1,200 Gannets fishing and loafing off the east coast of the island and an excellent count of 591 Snipe included large numbers at Brides Loch. While things got a bit blowy down south we enjoyed a couple of days of pleasant weather with lightish westerly winds and only a few showers worthy of seeking shelter from; there were a few landbirds on 27th including a late Redstart near Burray, a Siberian Chiffchaff still, another Long-eared Owl trapped at Holland, two Black Redstarts and 4 Wheatears remaining. There were also a few wildfowl on the move including three Whooper Swans, 7 Barnacle Geese and 48 Pink-footed Geese in amongst 500 Greylags. Sunny spells on the 28th produced a few new bits and pieces including two Goldfinches, three Crossbills and an increased count of 305 Snow Buntings; the Siberian Chiffchaff at Holland remained but refused to be trapped, 80 Twite was an improved count and 12 Whooper Swans also flew through which included six juveniles. We've had mixed bag of weather over the last couple of days with blazing winds and driving rain and nice, calm, sunny spells in between; good conditions in the morning of the 25th produced four Greenland White-fronted Geese in with the Greylags with single Canada and Barnacle Geese also noted, the Wood Sandpiper and Black-tailed Godwit remain and a single Little Auk was seen. There were a few new passerines seen in calmer conditions on the 26th with two Goldfinches and a Crossbill of particular note along with a new Garden Warbler plus lingering Stonechat, Yellowhammer and White Wagtail while small numbers of other migrants included an increased 27 Robins and a sprinkling of Thrushes, Blackcaps, Goldcrests, Chiffchaffs and Finches. Seven Great-northern Divers was also an increased count. Blazing westerly winds made being out in the field difficult today so migrant counts were slightly down with a Stonechat, two Black Redstarts and a Yellowhammer the highlights in amongst further reduced Thrush numbers, 41 Blackcaps and 24 Bramblings. A good look at the sea in the afternoon produced two each of Sooty Shearwater, Bonxie and Little Auk as well as a steady movement of 450 Gannets and several Divers including three Great-northerns. The Canada Goose remains along with the two Scaup and 8 Red-breasted Mergansers. Still a similar range of late autumn migrants across the island today just in slightly diminishing numbers; counts had dropped to 100 Blackbirds, 330 Fieldfares, 580 Redwings, 40 Blackcaps (including a Belgian control) and 50 Bramblings. Two Siberian Chiffchaffs were found and scrutinised in depth along with small numbers of both abietinus and nominate birds while two Black Redstarts added a bit of variety. Other little bits included two Little Auks and three Common Scoters on the sea, three Whooper Swans which passed over and the very long staying Wood Sandpiper still. Another fine autumn day with it almost becoming flat calm by mid-afternoon, there were still hundreds of migrants across the island but smaller counts than yesterday were noted; the best birds today included our overdue first Great Grey Shrike of the year in Laird's Park and the Richard's Pipits still near Garso. Thrushes again dominated the evening's bird log with counts of 360 Blackbirds, 650 Fieldfares and 850 Redwings recorded along with 72 Blackcaps, 9 Chiffchaffs, 104 Bramblings, 31 Robins and 15 Goldcrests. Other bits and pieces included three Ring Ouzels, a Whinchat, a Long-eared Owl trapped at Holland, two Yellowhammers also trapped, a handful of Redpolls with Lessers and Mealies forming small mixed flocks and a single Little Auk past on the sea. There were now two Scaup on Bewan and the single Canada Goose and 13 Barnacle Geese remain. A brilliant, classic autumn day with thousands of birds across the island; the bulk of the numbers were typically Thrushes with counts of 400 Blackbirds, 1,025 Fieldfares, 1,468 Redwings and 32 Song Thrushes most noteworthy. The highlights in amongst the multitudes included a Little Bunting briefly at Gravity, a Barred Warbler and a Crossbill trapped at Holland in the morning, the Richard's Pipit still at the north end and the first Iceland Gull of the autumn with another influx of Great Black-backed and big, dark agentatus Herring Gulls. The rest of the numbers consisted of 37 Robins, 108 Blackcaps, 16 Chiffchaffs (most pale abietinus birds), 4 Black Redstarts, two Ring Ouzels and a Long-eared Owl while the totals of 172 Bramblings and 232 Snow Buntings were forming big orange and white mixed flocks flitting across the fields. Other bits and pieces included an influx of wildfowl with 7 Whooper Swans, 13 Barnacle Geese, a Goldeneye and 9 Long-tailed Ducks noted and the long staying Wood Sandpiper and Black-tailed Godwit. After yesterday's rain and wind there was a fine array of migrants around the island today with the pick being our third Olive-backed Pipit of the autumn which showed well near the Obs in the late afternoon. The main feature was an excellent arrival of at least 106 Blackcaps with a Garden Warbler, a Whinchat, two Willow Warblers and a Lesser Whitethroat mixed in, Thrushes were also well represented with 180 Blackbirds, 320 Fieldfares and 300 Redwings counted. Other typical late autumn migrants included 2 Sparrowhawks, 13 Woodcock, a Short-eared Owl, 27 Robins, two Ring Ouzels, 14 Chiffchaffs, 50 Bramblings, two Black Redstarts, a Mistle Thrush and the year's first Yellowhammer. A build up of Gulls was also noted with 720 Herring and 350 Great Black-backed Gulls counted - mainly in the north of the island. A truly horrendous day with a blazing easterly gale and continuous driving rain making any attempts to get out in the field a bit of a mission...we did though, if only for a couple of hours in the morning up the west coast; as predicted there was an arrival of birds in these conditions with a Little Bunting at Inglis Geo the highlight with a Long-eared Owl, a Ring Ouzel, the first Sparrowhawk of the autumn, a Black Redstart and yesterday's Richard's Pipit still at Scottigar also of note. Numbers were made up of 145 Blackbirds, 100 Fieldfares, 60 Redwings and 30 Blackcaps but there is definitely more out there sheltering from the rain - high hopes for tomorrow as the conditions improve! A fine, clear day (although rather chilly!) with the highlight being two Richard's Pipits with one in the north at Scottigar and another near the airstrip; other birds included a few bits on the sea with two Sooty Shearwaters, 4 Manx Shearwaters and a single Little Auk seen from the hide, a long overdue year tick in the shape of a Scaup on Bewan, a few raptors floating around with 4 Merlins, a Hen Harrier and a Peregrine seen and the lingering Wood Sandpiper and Black-tailed Godwit still. There was a scattering of typical late autumn migrants across the island with the first two Greenfinches of the autumn at Kirbest along with a Mistle Thrush and two Lesser Whitethroats in amongst small numbers of Chiffchaffs, Blackcaps, Thrushes, Goldcrests, Finches etc. The Blyth's Reed Warbler was still present around the Observatory on the 16th with a drake Velvet Scoter (a scarce bird on the island!) past the seawatch hide the day's other highlight; also of note was one remaining Yellow-browed Warbler and lingering Wood Sandpiper, Great-spotted Woodpecker, Black-tailed Godwit and Canada Goose which all made it through to the 17th as well. The highlight of the 17th was a Coue's Arctic Redpoll which was trapped at Holland House in the morning - unfortunately the ringing team present at the time messed up and it wasn't realised as such until photos were looked at in the evening (we won't mention any names!). Also of note was a brief Chiffchaff ssp. near Burray which looked good for a Siberian, the Bluethroat still lurking in the Ancum Irises, a/the male Northern Bullfinch seen near Holland, a late Swallow also caught at Holland, 10 Jack Snipe and two Woodcock as well as small numbers of common migrants including Thrushes, Blackcaps and Goldcrests. A truly fantastic and hectic day with plenty of migrants and even a couple of rarities throw into the mix-just to spice things up a bit. Kicking things off mid-morning was a Blyth's Reed Warbler caught and ringed at the Observatory an hour after dawn. This is the fourth year in the row (and sixth individual) the species has been recorded on the Island, and it went on to show well throughout the day in the trapping area. A few hours later an Olive-backed Pipit was discovered near Sangar (an OBP or Tree Pipit flew high over the Observatory at dawn) showed well to the finder for a few seconds before taking to the skies and flying off high, north-east towards the lighthouse-hopefully it'll be re-located and more co-operative tomorrow! Next and just after midday an Arctic Redpoll was picked up flying over the Mill and subsequently tracked down at Gerbo, where it was seen well (but at a fair distance) and again only to the finder. It was thought most likely to be a 'hornemanni' race bird and was last seen flying towards Kirbest but wasn't re-located despite searching. There was a strong supporting cast which included a Canada Goose at Hooking, the 2 Wood Sandpipers still, yesterdays Great Spotted Woodpecker, a Yellow-browed Warbler at Kirbest, a Red-breasted Flycatcher at Newbiggin and the Northern Bullfinch at Holland still. The mist-nets there were again busy with commoner migrants numbering as follows; 2 Dunnocks, 39 Blackbirds, 8 Fieldfares, 12 Song Thrushes, 87 Redwings (including a Danish control), 2 Mistle Thrushes (including only the eighth to be caught and ringed), 43 Blackcaps, 7 Chiffchaffs, 9 Goldcrests, 2 Lesser Redpolls, 17 Mealy Redpolls plus 20 of one or another. A minimum of 5 Hen Harriers were seen, 3 of which arrived together off the sea at the Observatory and a Woodcock and 6 Jack Snipe were flushed during the day. Another crisp, cool autumnal day with just a handful of the expected arrivals given the current weather. New birds included a Slavonian Grebe off the north end, another new Great Spotted Woodpecker trapped and ringed, a Ring Ouzel along the west coast and a Yellow-browed Warbler at South Gravity. Other Warblers seen today were 3 Lesser Whitethroats, 15 Blackcaps, 4 Chiifchaffs and a late Willow Warbler, plus 10 Goldcrests. The Northern Bullfinch was heard at Holland House, while the days Redpoll saga featured at least 3 Lesser Redpolls (1 new bird trapped/ringed), 15 Mealy Redpolls (4 new birds trapped and ringed) and 4 unidentified-including a couple of ambiguous birds caught and ringed-don't you just love Redpolls!!! A Wood Sandpiper on Kirbest was presumably a lingering bird and at least 3 Hen Harriers toured the Island. With a cool 'north-easterly' wind in the morning it wasn't surprising that there were more Redpolls of various guises seen today. 3 of them were Lesser Redpolls (2 new birds trapped and ringed, plus yesterdays was re-trapped) along with at least 9 Meally Redpolls, while a flock of 10 Redpoll sp. near the surgery may have been different from those listed above? The highlight though was a fine male 'Northern' Bullfinch near Holland House in the afternoon-will it be another influx year? There was another small arrival of Thrushes with 108 Fieldfares and 258 Redwings, while Blackbirds are also becoming more noticeable and a couple of Chiffchaffs at Holland were both 'eastern' abietinus type birds. Another sea-watch logged 5 Sooty Shearwaters and a Common Scoter, but Fulmar numbers were much reduced with 875 passing by although the ratio of 'blue' phase birds was higher with 19 included in that total. The 2 Wood Sandpipers are still with us, 7 Jack Snipe were flushed, 2 Great Spotted Woodpeckers included another new individual and 2 Woodpigeons were the first for a while. Another busy day at the Holland House mist nets and there was also plenty of movement on the sea off the north end. Masses of Fulmars streamed past the hide with 6215-including 29 'blue' phase birds in three and a half hours. Our second (sixth Island record) Balearic Shearwater of the year mid-morning was the highlight and there were also 36 Sooty Shearwaters, 19 Manx Shearwaters, 10 Little Auks, 17 Puffins and 662 unidentified Auk sp. There's been an influx of Redpolls recently with the first Lesser Redpoll of the year trapped and ringed during the morning as-well as at least 7 Mealy Redpolls (3 trapped and ringed) present. Yet another Great Spotted Woodpecker was also trapped and ringed (a different bird from yesterday) while other land-birds included a Yellow-browed Warbler, 3 Lesser Whitethroats, 11 Goldcrests a Lapland Bunting and 343 Snow Buntings. A Whooper Swan toured the Island, a Woodcock was on the west side and 4 different Hen Harriers were noted. Finally there was a late Peacock Butterfly at the north end and 3 Risso's Dolphins were seen during the sea-watch. Not much to report from 10th with the strong, cold northerly wind moving more birds on rather than bringing in some new ones. An hours sea-watch from north yielded 3 Sooty Shearwaters and 10 Long-tailed Ducks while there were also 3 Lapland Buntings on Torness and 2 Barnacle Geese flew south. The nets were busy at Holland House from dawn on 11th with the first notable arrival of Redwings of the year. 365 were logged in all, with 56 trapped and ringed out of just under a hundred birds caught today. There was a new Great Spotted Woodpecker, the Bluethroat was still in the Irises at Ancum plus 4 Fieldfares, 14 Blackcaps, 2 Yellow-browed Warblers, 26 Bramblings and a Common Redpoll. 2 late Great Skuas passed by, 3 Whooper Swans flew north and 6 Jack Snipes were split between the Westness/Ancum areas. Common Redpoll-one of nearly 100 birds trapped/ringed today. A wet and windy morning turned into an even wetter and even windier afternoon as northerly gales and heavy showers battered the Island to a virtually un-birdable state. A Bluethroat, lurking in the Irises at Ancum Loch was the stand alone highlight, with the only other passerines seen being a handful each of lingering Warblers, Thrushes, Finches and yesterdays Whinchat. Another 6 Whooper Swans pitched into Gretchen late-afternoon, the 2 Wood Sandpipers remain, while 3 Ruff and a Black-tailed Godwit were the first for a while. Limited sightings from the 7th, which may have had something to do with two-thirds of the ornithological team vacating to Papa Westray in an unsuccessful twitch for a certain American passerine :-(. Seen by those more sensible were 4 Sooty Shearwaters on a sea-watch, a ring-tailed Hen Harrier and lingering Yellow-browed Warbler at Holland. On 8th there was another impressive Goose passage with a minimum of 1885 Greylag Geese and 130 Pink-footed Geese passing south over the Island during the day. 9 Whooper Swans pitched into Ancum briefly while 14 Red-breasted Mergansers represented a significant increase, and 3 Merlins included a couple of males hunting the Linnet roost at Holland. The late, lingering Wood Sandpiper was surprisingly joined by a second bird near Hooking, and 9 Jack Snipe were flushed at Kirbest. A Whinchat was nearby, while the Yellow-browed Warbler remains at Holland where most of the 14 Blackcaps were also present. Little change in the bird numbers over the weekend, with the weather really deteriorating late afternoon on 6th. The Olive-backed Pipit wasn't seen on the first date but was found to still be present at Rue on 6th where it showed well once again. The Great Spotted Woodpecker remained 5th, along with 2 Yellow-browed Warblers when Blackcaps numbered 23-and included a Belgian ringed bird. On 6th there were 8 Jack Snipes, a handful of Thrushes, 15 Blackcaps, 4 Yellow-browed Warblers, 12 Chiffchaffs, at least 18 Bramblings, 3 Lapland Buntings and 200 Snow Buntings. The wind dropped and once the rain passed through mid-morning it was a pleasant day in the field. There were a number of new arrivals with an obliging Olive-backed Pipit in the Rue area the best of the bunch. Another Corncrake was flushed- this time from a ditch at Neven, the Pectoral Sandpiper re-appeared at Kirbest and a Pomarine Skua flew past on the sea. There was still a Great Spotted Woodpecker around while counts of some of the commoner species came to 4 Jack Snipe, the first Woodcock of the autumn, 17 Robins, 49 Song Thrushes, 112 Redwings. 30 Blackcaps, 6 Yellow-browed Warblers, 34 Bramblings, 7 Chaffinches and 4 Common Redpolls. The strong south-easterlies continued, but a bit of rain helped drop in a few more birds than yesterday. The surprise highlight was a Golden Oriole which flew down the Links golf course (the most exposed part of the Island!! ), rested for 10 minutes then flew back north again. Other notables were the Great Spotted Woodpecker still and 4 Yellow-browed Warblers scattered around. Counts of common migrants came to 3 Jack Snipe, 4 Dunnocks, 17 Robins, 70 Wheatears, 24 Song Thrushes, 40 Redwings, 16 Blackcaps, a Whitethroat, 10 Chiffchaffs, 4 Lapland Buntings and another Snow Bunting influx with 173 logged. Golden Oriole-our 4th of the year!! A similar day to yesterday, with the strong south-easterly wind forcing the majority of migrants onto the more sheltered west coast. There wasn't really all that much change in the numbers with the Red-breasted Flycatcher continuing to show well along the west coast and a Long-Eared Owl in the Kirbest Crop the highlights. Among birds seen today were at least 5 Grey Herons, a late Whimbrel, Great Spotted Woodpecker, 12 Robins, 2 Yellow-browed Warblers and 4 each of Goldcrest and Common Redpoll. The strong south-easterly winds still whipping across the island continue to make birding difficult with most birds today being seen along the sheltered west coast; there was a scattering of new common migrants with traditionally later arriving birds starting to dominate the warblers etc. with a Woodpigeon, two Dunnocks, 8 Robins, 22 Song Thrushes, 41 Redwings, 6 Blackcaps, 7 Chiffchaffs, 7 Chaffinches and 11 Bramblings. 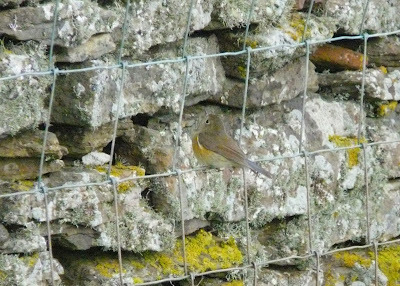 There were however still 4 Redstarts, 116 Wheatears, 4 Lesser Whitethroats and 5 Willow Warblers still present. Scarcities were represented by a single Great-spotted Woodpecker, the Red-breasted Flycatcher at Nether Linnay still, 6 Yellow-browed Warblers and the Wood Sandpiper.